Apple products are always described with words such as ultra, uber or explicit. So it only makes sense for the iPod accessories to come attached with these descriptions as well. The Marware Sportsuit Basic (SBV) features a neoprene orca material that also allows for a belt clip attachment. Marware get a tick in my good books for their ‘ultra’ discreet interchangeable belt clip system. I’ve moaned about it in other reviews where you have the attachment protruding out and taking away any positive good looks that the iPod or the case has. Not so with the SBV. Whilst Marware don’t specifically feature this case as being waterproof, neoprene is usually the material you use for keeping things dry. It’s not by any means a water-tight case but for light rain or accidental splashes, you can be secure that your iPod will be out of harms way. To put your iPod inside can be a slight effort at first but once it’s in their, it’s a snug fit. I believe this case can cater for both the 30GB and 60GB model because it literally stretches and then hugs to the appropriate iPod size. You can tell that the designers have thought about accessibility to the controls as well as connectivity. Starting with the top of the case, the hold switch position is marked on the case and you can just nudge it with a finger nail. The headphone jack whilst smaller than usual, my cassette adapter which comes with a rather large jack fit without any problems. About 90% of the front is made of a flexible plastic material and the rest is neoprene. The front allows full access to the scroll wheel and normally doesn’t detract from the quality of the iPod screen. With all the good things I have to say about this case there are a few issues that I’ve discovered whilst using it. One thing is the formation of what I can only describe as a condensation patch? I’ve removed the iPod from the case and given it a good clean and wipe down with a dry micro fibre cloth as well as giving the inside a wipe too but this doesn’t seem to have solved the problem. The patch remains in the same area all the time. I wouldn’t be bothered about this if it didn’t affect the viewing quality of the screen, but it does. It’s also just annoying seeing it there. The other issue is removal of the iPod from the case. 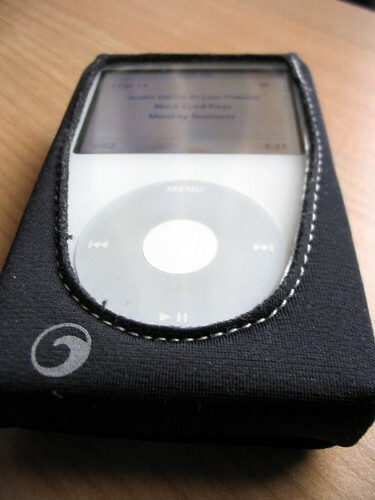 Whilst the neoprene material does stretch and allow for a lot of flexibility, I find it a struggle to remove the iPod from the case. You really do have to give it a good pull before it pops out. I’m guessing the condensation patch isn’t helping either, I think it makes the iPod stick to the plastic front enough to make it more of a struggle to remove. I could be wrong about that though. What I do know is it’s difficult to remove your iPod without a fight. Most people probably wouldn’t need to remove the case as often as I do and if you do keep it in the case most of the time; you needn’t worry about connecting a docking cable to your iPod. As explained before you still have access to the hold switch and the headphone jack. Where you normally locate the dock connector, you can just unfold the bottom part of the case to reveal it. Like most if not all cases you won’t be able to use a desktop stand or dock whilst the case is on. Some other good things I have to say about the SBV, is the ‘ultra’ slim, ‘uber’ streamlined and ‘discrete’ weightless design. 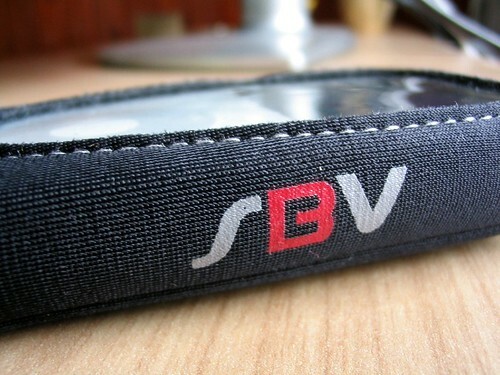 When you’re holding your iPod with the SBV on it, you get that confident feel that your iPod is safe from ‘everyday life’. You probably wouldn’t get away with many drops but that’s not what this case is about. I like this case for its skin-tight design and excellent form factor. It holds so tight to your iPod that you only add just a few millimetres of bulk to the iPod that’s been on a diet over the past few years. Due to problems with the condensation patch, the SBV just misses out on the TechCast Recommended award but it is none the less still an all round excellent case.